Monitoring best practices in a world of containers & microservicesStijn Polfliet, New RelicPerformance monitoring in a container & microservices world is very different from monitoring a traditional environment. During this talk, we will start by looking at some best practices to build a successful container platform. We will then look at the important performance metrics to support these best practices and a live demo for each of them.You will learn how monitoring can help to enforce the 5 best practices of building a successful container platform.Stijn joined New Relic as Principal Technical Evangelist in October 2018. Stijn was co-founder and CEO of CoScale, a provider of full stack monitoring for containers & microservices, acquired by New Relic in 2018. Stijn holds a PhD in Computer Science from Ghent University in Belgium. 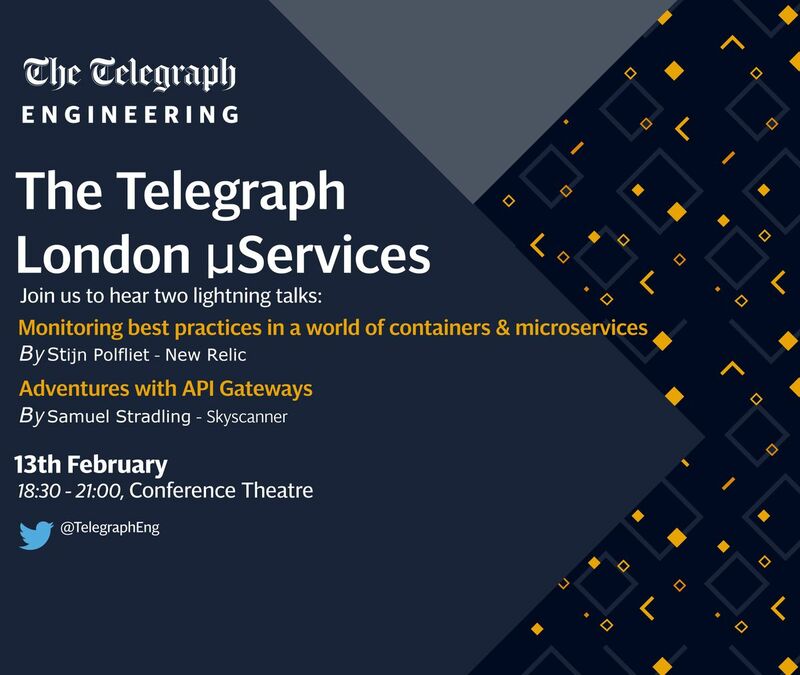 His interests focus on new cloud technologies like Docker, Kubernetes and their performance-related aspects.----Adventures with API GatewaysSamuel Stradling, SkyscannerEffectively managing API gateways is key to successful microservice adoption. At Skyscanner, we run microservices in four AWS regions around the world. To provide features for our microservices such as key authentication, failover, bot blocking and rate limiting, we use Kong, an open source API gateway built upon NGINX, along with an extensive set of tooling to automate the deployment and configuration.My talk will focus on the mistakes, pain points and production incidents caused when running API gateways, along with the benefits that they can provide.Key takeaways:- Overview of API gateways and their uses with microservices.- What do microservices look like at Skyscanner?- Lessons learned from the design and running of API gateways for microservices.Sam is a Software Engineer at Skyscanner. He has worked on a range of routing-related problems to help resiliently serve API requests from multiple AWS regions globally for millions of users every day.